This Instant Pot egg salad is now a weekly staple in our house. It’s SO easy and inexpensive and versatile and delicious and good for ya and all those happy things! To make the eggs, I use the recipe I wrote about in this post. Go there and link through for the detailed version. If you’re an Instapot pro, then this might be all you need to know: grease/spray an oven-safe dish, crack in 8 eggs, add 1 cup of water and place dish on the rack. Manual pressure cook 5 minutes and allow 5 minutes natural release and you’ll have the following egg “loaf” in your dish. Think of it as one giant hard-boiled egg with 8 yolks! You can then make the egg salad right in your bowl. We have been using Thomas’s fool proof recipe for fluffy, creamy egg salad: a potato masher and mayo. Also, Thomas will tell you not to use anything but Duke’s mayo. He’s hard-core about it: not negotiable. Mash it all together with your potato masher for an even, chopped consistency. The end result makes 4-6 servings depending on how much you want. 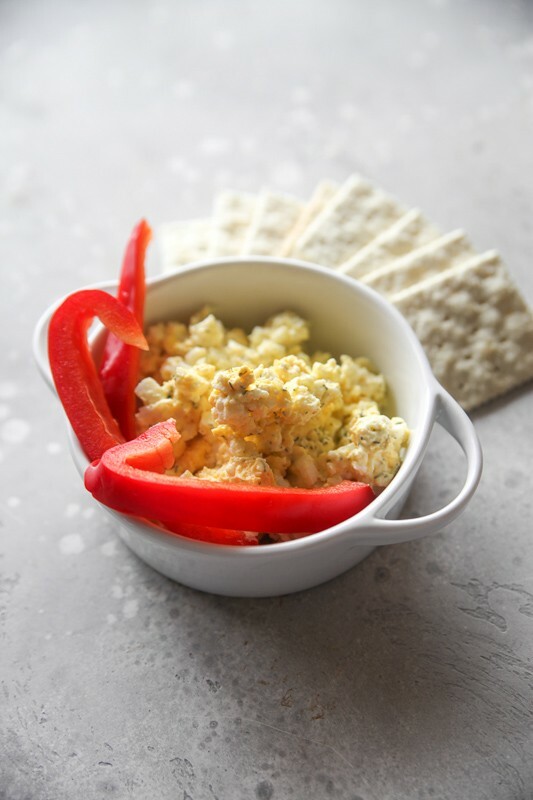 This egg salad is made super simple using an Instant Pot and then kept pure with just four ingredients: mayo, dill, salt and pepper. Enjoy with crackers, on a sandwich, or with raw veggies. Add 1 cup of water to bottom of Instant Pot and place rack inside. Place dish on rack and cook manual pressure for 5 minutes. Allow 5 minutes of natural release and remove cooked eggs. Once slightly cool, add mayo, dill, salt and pepper and mash with potato masher until thoroughly mixed.